This was our second NYE cruise and third time on the Adventure. We appreciated the upgrades that were added in the last dry dock. Embarking and debarking were easy, probably the best we have ever experienced at Port Everglades. We had a walkoff with the Suite Concierge and it took 12 minutes total. 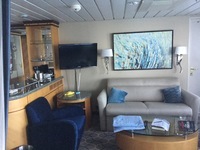 Our grand suite (1578) on deck 10 was lovely and very convenient to the elevators. Very large with plenty of storage, a mini fridge, wetbar, a nice bathroom and balcony. 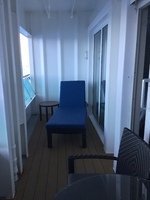 The balcony had a padded lounger, a table and two chairs. It is completely covered, and was quite pleasant most of the time. We were a little concerned the cabin might be noisy as we were located under the pool deck, but that was only an issue on NYE when we tried to turn in around 12:30. 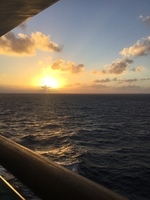 Once the deck party ended, all was quiet again. We had the Ultimate Dining Package and enjoyed one dinner at Chops, one at Izumi and four at Giovanni’s Table. Chops and Izumi are both on the Royal Promenade and were a little too noisy for us. Giovanni’s Table is located next to the Windjammer with a beautiful ocean view. We got great service from Amar and Arvind at GT. Christopher was the Suite Concierge and did a great job. He made our dinner reservations pre-cruise, though we changed several onboard. He also hosted a suite party at Giovanni’s Table for lunch one sea day. The party was well attended with many officers, including the Captain and Hotel Director. Nearly every day we received goodies in our suite, including gifts from the Captain, the Hotel Director, Christopher and the casino. We had requested a beach towel as our Diamond Plus gift, but housekeeping called and said they were out. So they substituted a tote, which came in handy as we were packing. Service was good throughout the cruise. Our cabin steward, Renato, was very good and kept the cabin in great shape. Mercedes was the cruise director, and did a fine job. Entertainment was good. We really enjoyed the production shows, the comedian and the staff talent show, Adventure’s Got Talent. The outdoor movies were fun, including Mamma Mia, Here We Go Again and Oceans Eight. 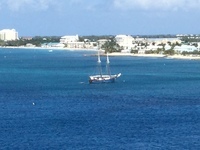 We had colds all week so we stayed on the ship in Grand Cayman. In Costa Maya, we took a taxi to the town and enjoyed a great walk. At Cozumel, we shopped at the port and returned to the ship early. Even though we were not feeling the best, we had a great time and will gladly sail on the Adventure again. This was our second NYE cruise and third time on the Adventure. We appreciated the upgrades that were added in the last dry dock. Embarking and debarking were easy, probably the best we have ever experienced at Port Everglades. We had a walkoff with the Suite Concierge and it took 12 minutes total. 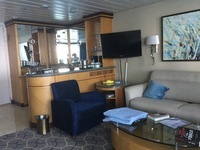 Our grand suite (1578) on deck 10 was lovely and very convenient to the elevators. 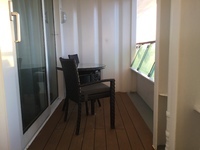 Very large with plenty of storage, a mini fridge, wetbar, a nice bathroom and balcony. The balcony had a padded lounger, a table and two chairs. It is completely covered, and was quite pleasant most of the time. We were a little concerned the cabin might be noisy as we were located under the pool deck, but that was only an issue on NYE when we tried to turn in around 12:30. Once the deck party ended, all was quiet again. We had the Ultimate Dining Package and enjoyed one dinner at Chops, one at Izumi and four at Giovanni’s Table. Chops and Izumi are both on the Royal Promenade and were a little too noisy for us. Giovanni’s Table is located next to the Windjammer with a beautiful ocean view. We got great service from Amar and Arvind at GT. Christopher was the Suite Concierge and did a great job. He made our dinner reservations pre-cruise, though we changed several onboard. He also hosted a suite party at Giovanni’s Table for lunch one sea day. The party was well attended with many officers, including the Captain and Hotel Director. Nearly every day we received goodies in our suite, including gifts from the Captain, the Hotel Director, Christopher and the casino. We had requested a beach towel as our Diamond Plus gift, but housekeeping called and said they were out. So they substituted a tote, which came in handy as we were packing. Service was good throughout the cruise. 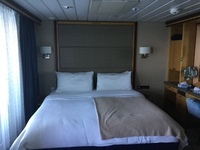 Our cabin steward, Renato, was very good and kept the cabin in great shape. Mercedes was the cruise director, and did a fine job. Entertainment was good. We really enjoyed the production shows, the comedian and the staff talent show, Adventure’s Got Talent. The outdoor movies were fun, including Mamma Mia, Here We Go Again and Oceans Eight. We had colds all week so we stayed on the ship in Grand Cayman. In Costa Maya, we took a taxi to the town and enjoyed a great walk. At Cozumel, we shopped at the port and returned to the ship early. Even though we were not feeling the best, we had a great time and will gladly sail on the Adventure again. Great cabin. Nice location and very quiet at night. First cruise for grand-son; whom now says someday he will be pinnacle.